The basics of power transistor specification and selection have not changed much since they became widely commercially available in the 1960s. Although available package shapes, power handling, cutoff frequencies, and other parameter options have been greatly expanded, still the most important aspect is not just selecting a power transistor but properly mounting it to ensure that the rated heat dissipation capacity will be realized. This article touches on some of those considerations and how to effectively deal with them. Discussion of important mechanical, electrical, and thermal characteristics to familiarize the technician with several basic transistor limits. 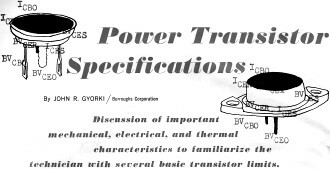 Although a great number of power transistor specifications can be devised (and the number seems endless), a few of the more common and important mechanical, electrical, and thermal characteristics will be discussed. Without a doubt, the sophisticated power transistor as we know it today would not exist if it were not for the absolute control of a myriad of fine characteristics during manufacturing and sorting. However, we are concerned only with the ratings that decide how we can best keep a device operating at its highest efficiency. One of the industry's most common power transistor package styles is the diamond base, also commonly known as the "TO-3." It has straight pins that can be plugged into a suitable socket (through a heat sink or radiator) and is usable with emitter currents of ten amperes or less. Socket connections, however, are not satisfactory connections and develop voltage drops; just as voltage drops across a resistance. Also, excessive heating losses occur when currents above the ten-ampere rating are used. Therefore, we must utilize a more substantial type of transistor. Another equally popular style is the round type, "TO-36." It is generally used for emitter currents of 15 amperes and above. Two straight pins are used for the base and emitter connections with holes in them for soldering or they are available with tinned leads welded directly to short emitter and base studs. In both types, the collector is mechanically and electrically fastened to the transistor case. The case serves as the collector terminal and thermal radiator connection. This is done since the collector junction becomes very warm during operation. 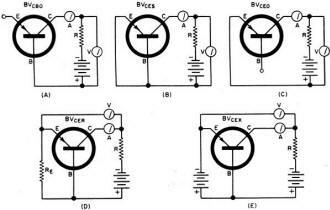 The emitter and base leads usually can be identified by observing an "E" and a "B" stamped on the transistor case near the respective leads. However, this is not always the situation, so a basing diagram for the particular transistor being used should be consulted. Fig. 1 shows the typical lead arrangement for both styles. Fig. 1. Two common power transistor basing arrangements. In both cases collector is internally connected to case. The diamond package is held in place by a 6-32 screw inserted through each hole in the opposite corners of the heavy mounting base. The round style is mounted by a single threaded stud projecting outward from the bottom. A 10-32 nut and lock washer terminal is used to secure it in place. The recommended torque on the TO-36 mounting stud is 12 inch-pounds; no more should be used. Appropriate insulating washers are often used at this time to electrically insulate the transistor from the heat sink. This will be discussed more fully under thermal conditions. Transistors are not mechanically shockproof in themselves. However, their rigid construction makes them suitable for use in rugged type equipment. They are hermetically sealed with a metal cap, either hot or cold welded to the mounting base. This excludes moisture and light, both of which can degrade the quality of the device. Leakage Current: Collector cut-off currents are simply other words used for discussing inherent leakage currents associated with the collector while the base and emitter are held to pre-determined conditions. One of the most important collector leakage currents is ICBO or more commonly, ICO. See Fig 2A. It is a leakage current from collector to base with the emitter open-circuited and is critical because it is most susceptible to temperature variations. Since power transistors operate with high junction temperatures, changes in ICO could greatly affect the stability of the transistor and circuit. ICO can easily be demonstrated by constructing the circuit of Fig. 2A. Heat from your hand or a lighted match brought near the transistor will change the indicated leakage current enough to be quite obvious. Leakage current from collector to emitter with the base circuit open is termed ICEO. This is a condition that could be expected in switching applications; the base open and the collector supply voltage present across the collector and emitter. In better switching circuits, however, the base circuit is not entirely open. It is usually reverse-biased or connected to the emitter by a low value resistor. Two other collector leakage currents are ICER, with a specified resistor from base to emitter, and ICES, with the base shorted to the emitter. They, as well as ICBO, are measured with the conventional reverse-bias voltage from collector to base. See Figs. 2B and 2C. These leakage currents vary from a few microamperes to a few milliamperes, depending on the specific transistor type. They are among the most critical power transistor ratings and should be kept as low as possible. Increased leakage current causes a rise in junction temperature; a rise in temperature creates more leakage current. This condition is called thermal runaway and, if not controlled, could end in the destruction of the transistor. Outside factors which generally determine the over-all stability are controlled by the circuit designer. Voltage Breakdown: Collector breakdown voltage is that reverse voltage applied between collector and emitter where the collector current begins to avalanche and the collector current becomes independent of collector voltage. This constitutes a group of breakdown voltages where the base and emitter are held to various constants. One such voltage is BVCBO, the reverse breakdown voltage between collector and base with the emitter open. See Fig. 3A. Two other breakdown voltages are BVCES, base shorted to emitter, and BVCEO, the base open-circuited. Refer to Figs. 3B and 3C. These are important considerations when circuits with inductive loads are used. During transient voltage peaks the actual instantaneous voltage present between collector and emitter may be very much higher than the supply. It is at this time especially we do not want the collector-to-emitter voltage rating exceeded. Another breakdown voltage is BVCER. This arrangement has a specified resistor between base and emitter (usually around 10 ohms). See Fig. 3D. BVCEX is the reverse breakdown voltage between collector and emitter with a small reverse bias between the base and emitter of 0.1 volt or more. This constitutes the absolute maximum surge voltage limit that the transistor can tolerate. Collector saturation voltage, VCE (sat), is that small voltage appearing between collector and emitter with such large base drive applied (forward bias) that any further increase in base current will not change the collector current appreciably. In other words, this is where further collector injection (by the base) brings to a halt the further increase of collector current. Current gain is no longer considered existent at these high current levels. Saturation voltage ratings of most transistors are measured with a specified value of collector and base current. Current Gain: Transistor current gain, beta, is the ratio of a change in collector current to a change in base current. This is the actual usable current amplification rating of a particular transistor. Current gain specifications in power transistors are generally given a range of values for a specific transistor. These values are known as "large-signal current gain" and are primarily used over the mean values of maximum collector currents. "Small-signal current gains" are sometimes specified for medium- and high-power transistors, but more generally are considered a special case, since only a very small portion of the allowable collector current is actually used. That is, the current gain of a power transistor is much higher at low collector current levels than at high collector currents. 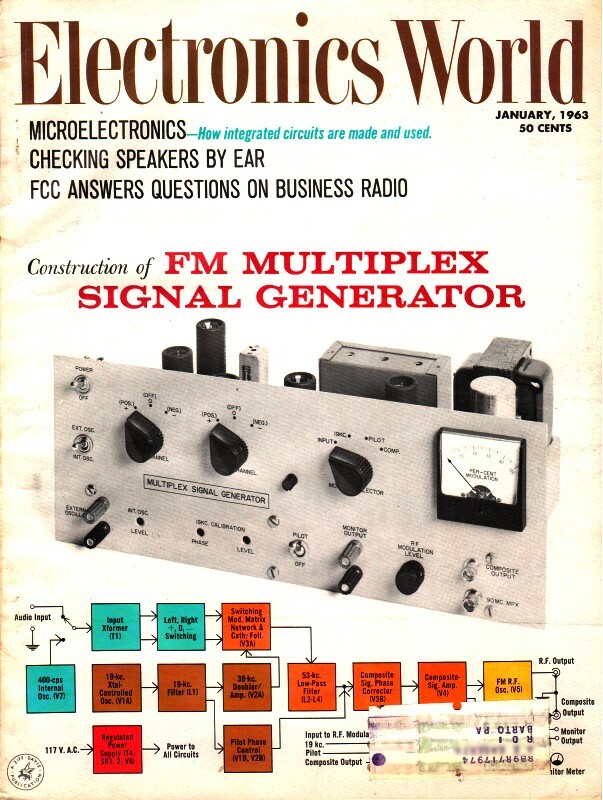 Cut-Off Frequency: Current gain frequency cut-off, fae. (common emitter), is that frequency where the small-signal current gain of the transistor is 3-db down from some pre-determined value specified at a particular frequency. This means that the current gain at fae is 0.707 of the value specified at some reference frequency (usually 1 kc.). The actual cut-off frequency is usually 10 kc. for most common power transistors. Other Characteristics: There are a few other normal operating characteristics concerning voltage and current that are important and should be considered. Fig. 2. 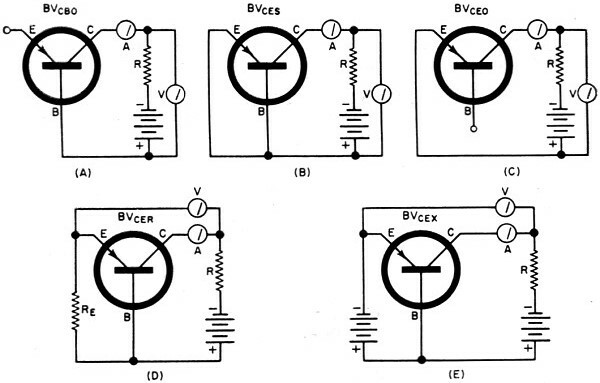 Circuits for measuring leakage currents of transistors. Maximum emitter current is a common rating and means just that; the maximum emitter current that can flow before permanently damaging the device. This is probably one of the first practical operating ratings considered for either replacement or new design purposes. Collector-to-emitter voltage is usually specified with the base shorted to the emitter or with the base open-circuited. In either case, the rating is specified with a certain value of collector current. Collector diode voltage, VCB (voltage, collector-to-base) is indicated with a value of emitter-to-base voltage. The actual circuit supply voltage should be less than the collector diode or collector-to-emitter voltage ratings. Fig. 3. The various breakdown-voltage measurements are depicted. Base current is usually given as a continuous value or a maximum value. This base current rating should not be exceeded or the junction will overheat and destroy the transistor. Power dissipation and junction temperature rise are directly related since the rise in junction temperature is caused by power being dissipated in the junction. The maximum allowable junction temperature of germanium power transistors is 100°C (212°F). Any higher temperatures will soften and finally melt the germanium. The average power dissipation is equal to the emitter current multiplied by the collector-to-emitter voltage. This will yield a hyperbolic curve that can be found on typical output characteristics curves. The transistor circuit load line, incidentally, must stay under this curve to insure reliable operation of the transistor and keep excessive power dissipation in the junction down to a safe level. Thermal conductivity is the ability of a material to transmit heat along or through itself. The heat conductivity path from the transistor collector junction to the ambient air must have as little heat resistance as possible. Since the junction of an operating transistor heats and the temperature of the ambient is normally less than the transistor junction temperature, it is desirable to have the junction heat radiating into the surrounding air and allow the junction to approach the temperature of the ambient. If the heat transfer path from the transistor junction to the air were 100% efficient, the junction temperature would be the ambient temperature. However, this is not practically possible. Between the transistor junction and the ambient air we find the connection between the junction and the case, case and insulator, insulator and heat sink, heat sink and air; all of which total up to an opposition in the path from junction to air. These obstacles are known separately as thermal resistance. Each different thermal resistance has a unique coefficient number. The coefficient of thermal resistance is expressed as a temperature in degrees centigrade per watt of dissipation. Due to these resistances, there will always appear a temperature differential between transistor junction and ambient. This temperature differential must be reduced to as low a value as possible. TJ = PD (θJC + θCS + θSA) +TA where: TJ = junction temperature in degrees C, PD = power dissipation in watts (collector current x collector voltage), θJC = transistor thermal resistance in degrees C/watt (junction to case), θCS = insulator thermal resistance in degrees C/watt (case to heat sink), θSA = heat sink thermal resistance in degrees C/watt (heat sink to ambient), and TA = ambient temperature in degrees centigrade. Insulators used are mica, Teflon, or anodized aluminum. They are used only where the collector must be electrically insulated from the heat sink, but not thermally, Silicone grease applied in small amounts between the transistor and heat sink (and insulator when used) can reduce thermal resistance even more, enhancing total heat dissipation. Teflon has the highest thermal resistance with mica second and anodized aluminum the lowest. Teflon and mica are not as me­chanically durable as anodized aluminum, but scratches through the anodized coat on both sides of the aluminum can electrically short the transistor to the heat sink. Silicone-coated mica insulators seem to be the most popular choice at the present time in the industry at large. However, no insulator at all, with silicone grease between the transistor and heat sink, is the best possible situation. The maximum amount of heat trans­fer takes place in the immediate vicinity of the mounting studs on the TO-36 package and around the holding screws on the TO-3 package. The mounting sur­face is smooth and made of copper or is plated with another metal, such as nickel, to enhance thermal conductivity. In general, securing a heat radiator to the cap of the transistor affords little or no heat dissipation. The transistor mounting base surface is the only reliable area for connection to a heat sink. The many power transistor specifications that are required in the manufacture of transistors are not necessarily the same specifications required for field technicians. Once the transistorized equipment is designed and used, the technician need only be aware of certain practical and general precautions in the replacement of transistors, that is, if he does not have a direct replacement, a substitute may be used. In such a case, a knowledge of a few transistor characteristics will assist him in making an intelligent guess as to a proper replacement and insure operation of equipment.